Middle School Track at Spencer has been canceled for tonight due to the weather. 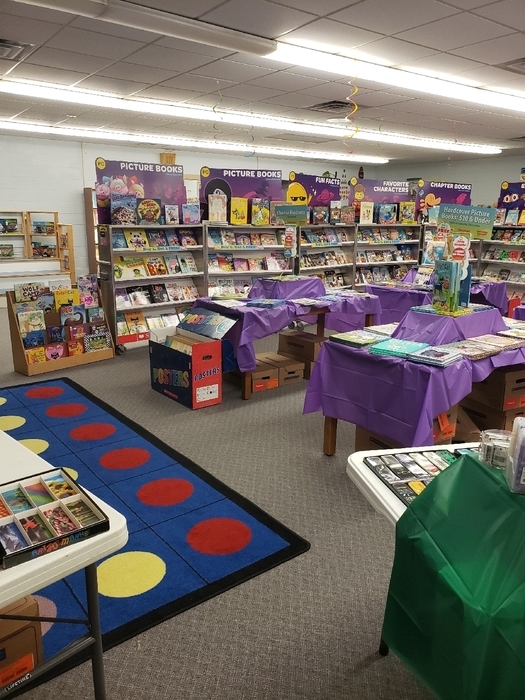 Get ready for a Dino-Mite Literacy Night this Thursday! 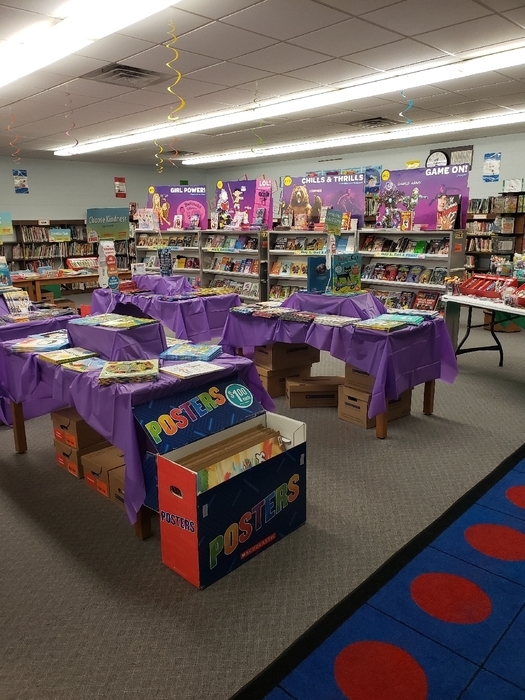 Plus the Scholastic Book Fair-buy one and get one free is ready to go. It will be a dino-rific week! 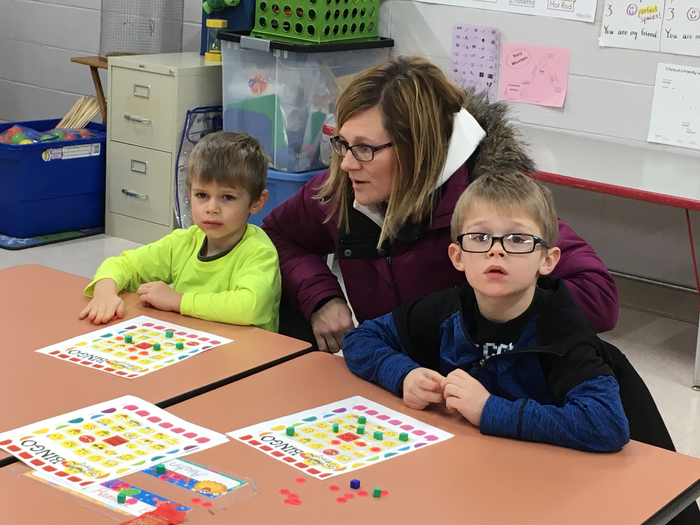 Mrs. Byrd's first graders enjoy learning in the "Byrd House!" Both Middle and High School track meets are canceled for tomorrow. High School has a meet Monday bus leaving at 2:30. Middle School has a meet on Monday bus leaving at 3:00. 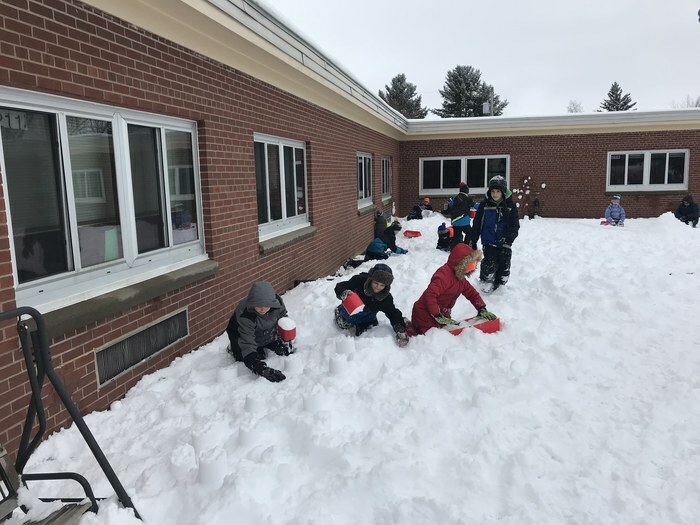 Second graders took time to enjoy the sunshine and practice math skills in the outdoor classroom. 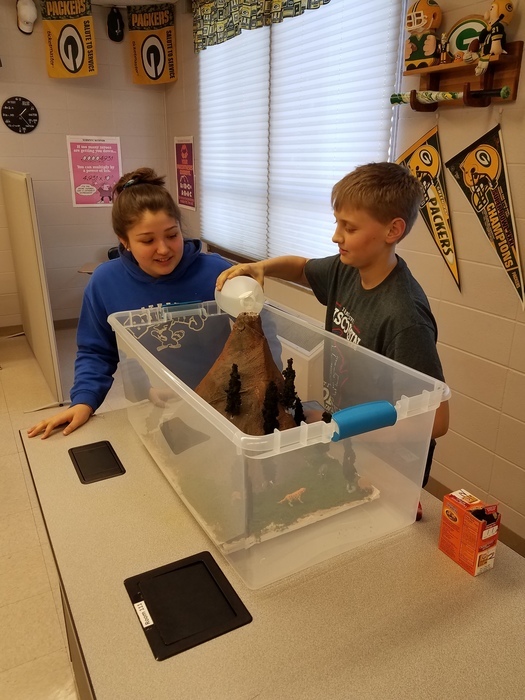 Mrs. Haines's 3rd Graders have been studying natural disasters in science. Today they worked on building volcanoes to see how they work. Varsity Softball Game in Amherst for today has been cancelled. 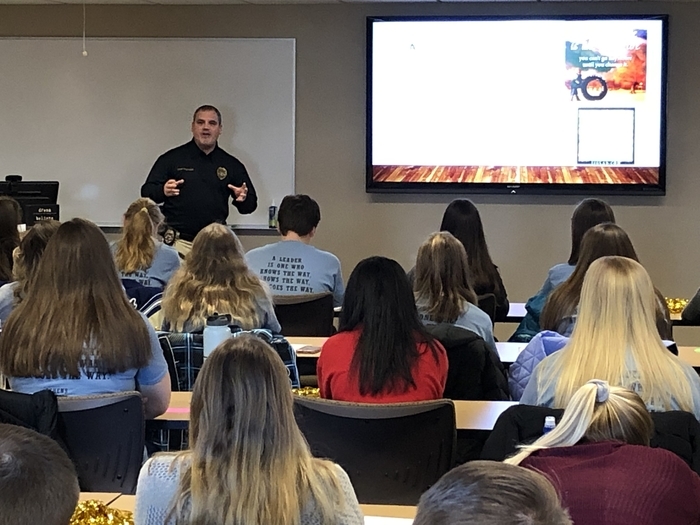 Attention FFA members, families, and supporters: This is just a reminder to please contact Ms. White at swhite@athens1.org or 715-257-7511 Ext 132 to RSVP if you and your family are planning on attending chapter banquet on Saturday 4/27. This is just to ensure we have an accurate count for food, payment can be made at the door! Thank you! HS Forensics. 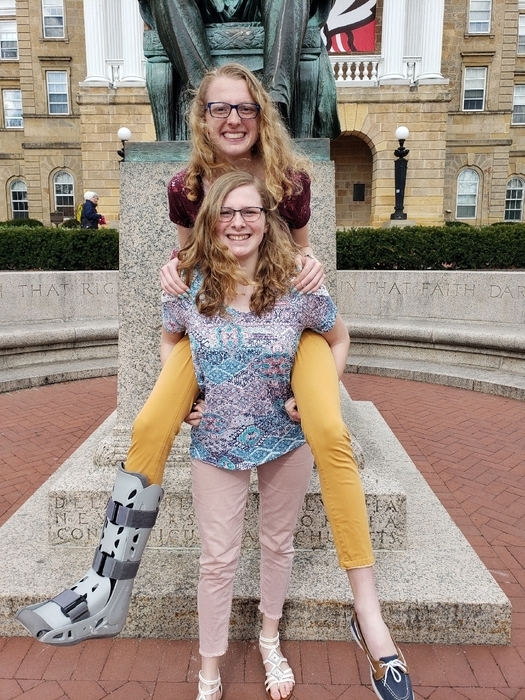 More sibling fun. So proud of AHS forensics team! 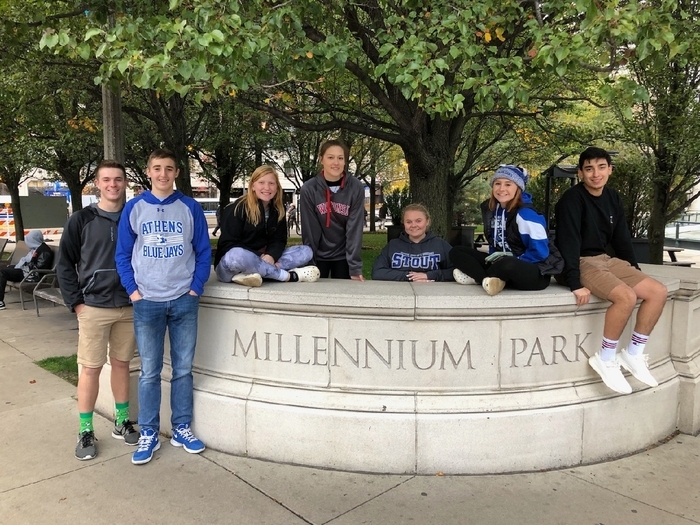 Check out group, seniors, and siblings! Baseball and Softball vs Tomahawk and Greenwood on 4/13/19 is CANCELED. Middle School Softball vs Spencer is Postponed. Baseball and Softball at Aubundale has been postponed for tomorrow. Tinker Tub Tuesday at AES! 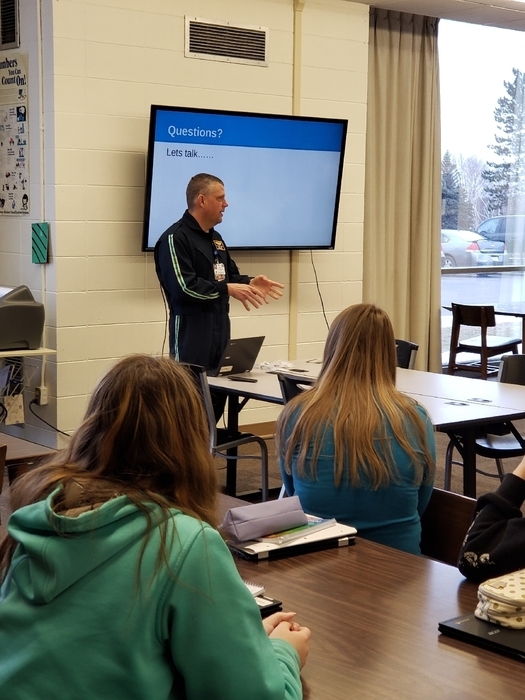 Steve Brewster from Aspirus Medivac shares his flight nurse experiences with AHS students interested in the medical field. Due to the possible weather conditions moving in later this week, Spencer has decided to call off the track meet on Friday, April 12 in Spencer. 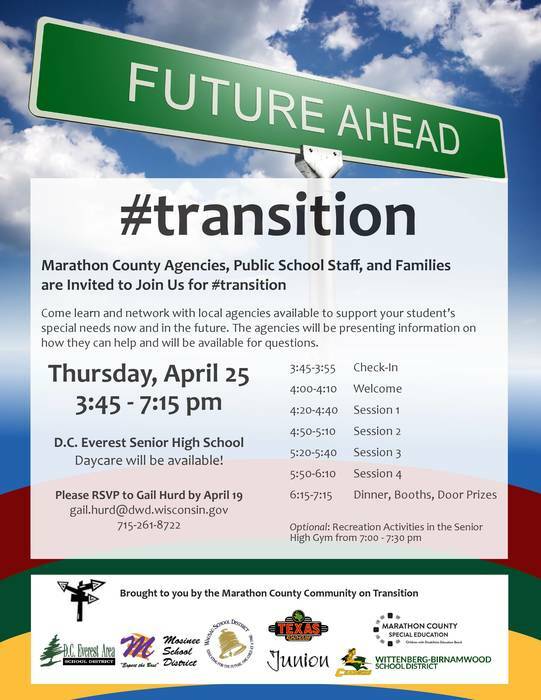 Come learn and network with local agencies available to support your student’s special needs now and in the future. The agencies will be presenting information on how they can help and will be available for questions. 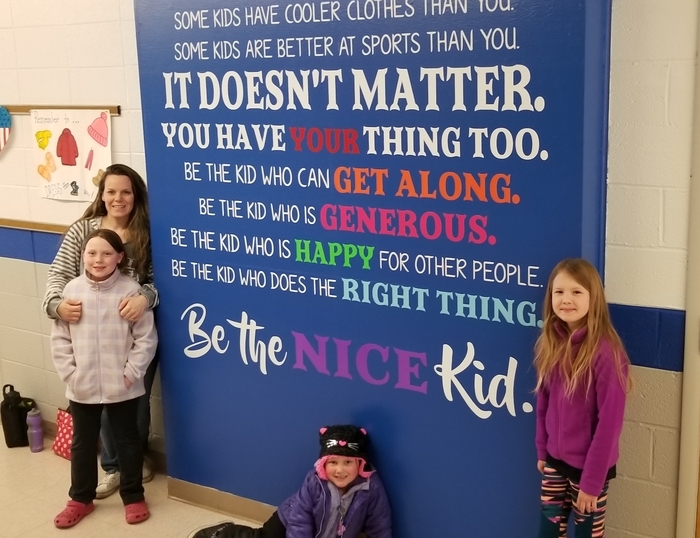 A big THANK YOU to Stefanie Switlick and Brenda Paul for jazzing up the fourth grade hallway at Athens Elementary! 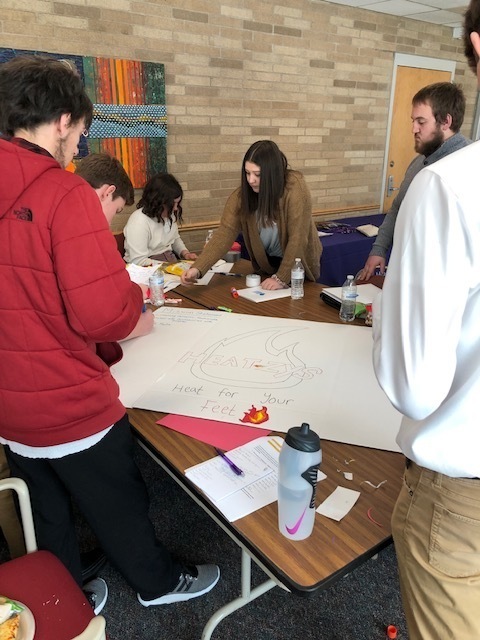 Littles connect with Bigs as part of the Big Brother Big Sisters program to provide encouragement, guidance, and friendship. Varsity Baseball at Stanley-Boyd has been POSTPONED for today. JV Softball vs Edgar - location change, now a HOME game. Softball game vs WR Assumption today (4/5/19) has been cancelled. We have rescheduled our baseball game with Thorp for tomorrow, 4/5/19 in Thorp. Game time, will be 4:45-5:15 or so. 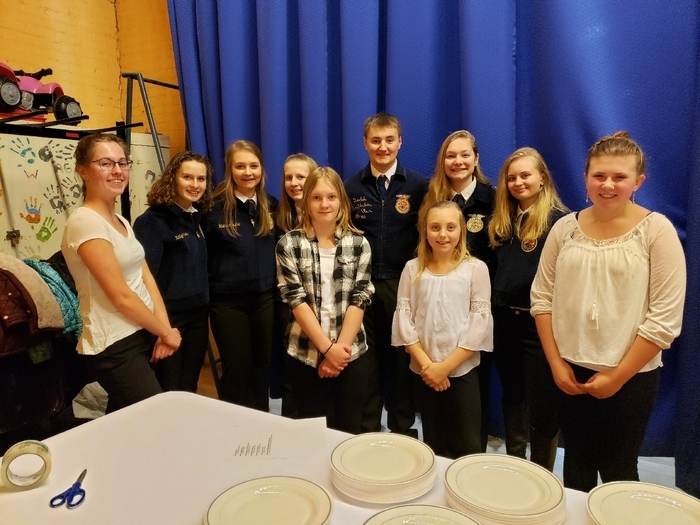 The Annual Athens FFA Awards Banquet will be held at the high school on Saturday April 27, 2019! 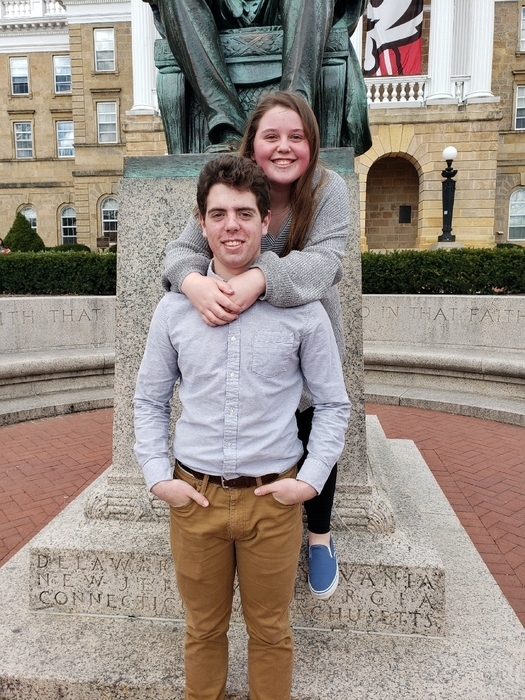 We are excited to recognize the achievements of our members! We will be serving a full meal starting at 6pm and will start awards at 7pm. Tickets are 5$ for adults, 3$ for children and FFA members are free. Please contact Ms.White to RSVP by Monday April 15th! swhite@athens1.org Thank you! 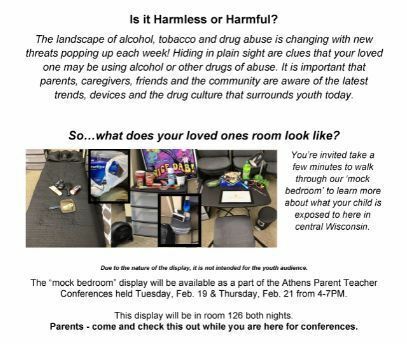 Attention high school students and parents! Post-Prom Party tickets will be sold during lunch times on Thursday, March 28, and Friday, March 29. Advance ticket prices are $5 and students will be guaranteed a prize. Ticket sales at the door will be $8 and students will not be guaranteed a prize. Parents will receive notification if their child purchases an advanced ticket. The Post-Prom Party will run from 11:00 p.m. to 2:00 a.m. on Saturday, April 6. Those that are riding tonight need to be at the High School at 6pm for the rider meeting. Also tickets for Donkey Basketball will be available at the door. 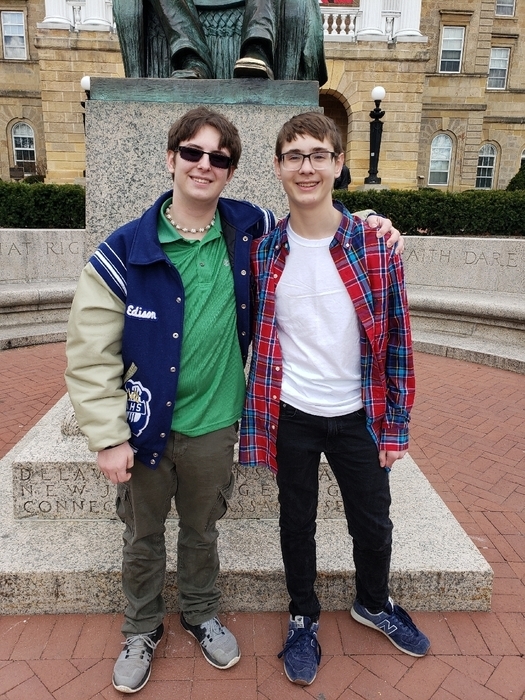 Good luck at state youth wrestling Garrett! Do you know any recent college graduates? 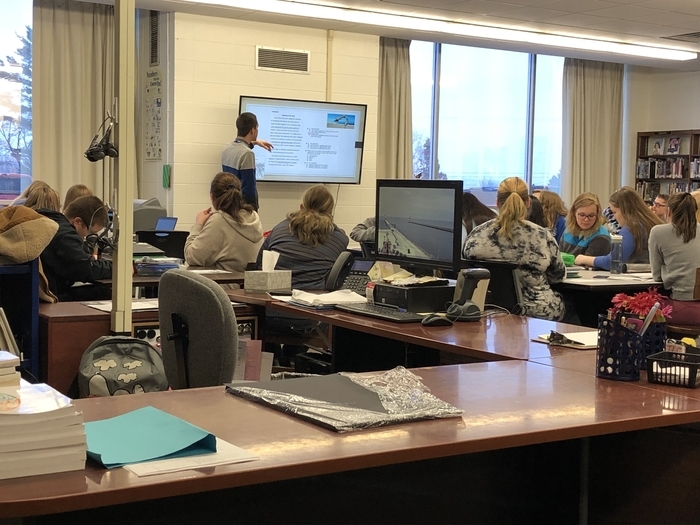 The School District of Athens is seeking qualified teaching staff to teach summer school Monday-Thursday from June 10-June 27. 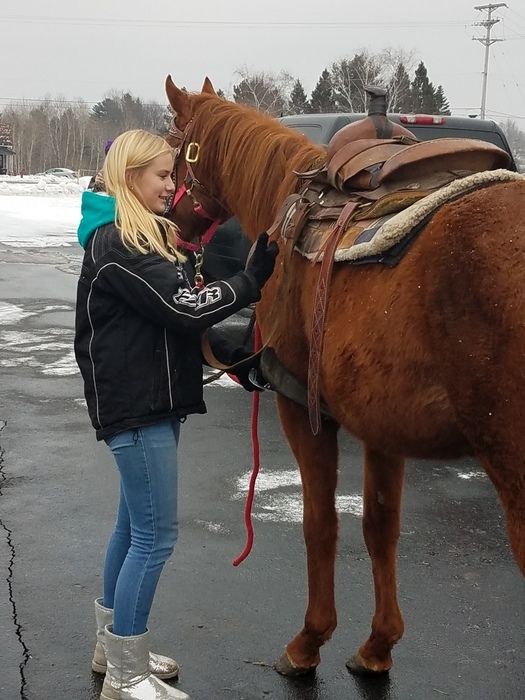 Interested parties should contact Beth Steinke at 715-257-7571. After reading a Superkids magazine about games in foreign countries, Mrs. Byrd’s class made plastic bag and rubber band soccer balls that they were able to try out in the hallway - learning SCORE! 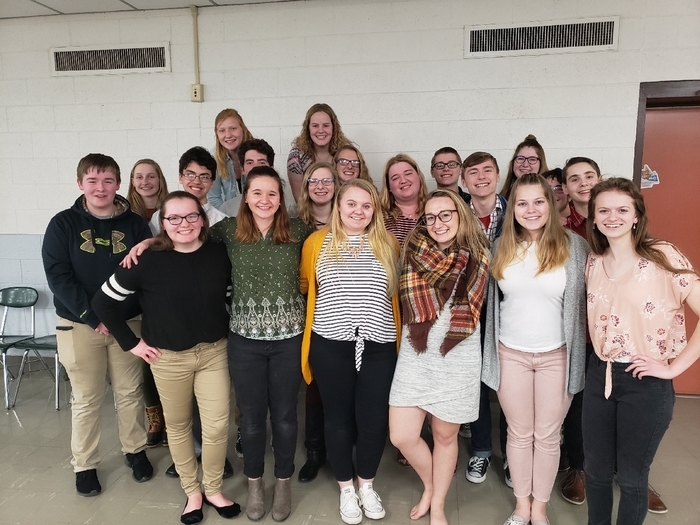 Congratulations to the High School Forensics team! 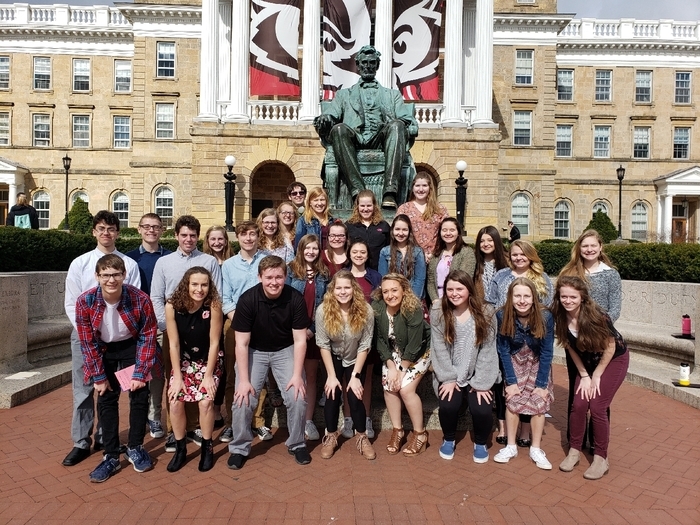 26 students in 13 events will be advancing to state competition in Madison on April 12-13. AHS is proud! Today, Thursday, March 14, all schools will be under a two hour delay due to the extreme fog in the District. Again, all schools today are under a two hour delay. Unknown to us earlier this morning, the country side roads have caused a delay of buses. We will excuse students for their tardiness AND excused them if they are not able to get to school at all today. This is due to ice-covered, snowy roads over gravel. Reminder to parents of Juniors - We will start our Junior Parent information session at 6:30 pm in the gym. Hope to see you there! 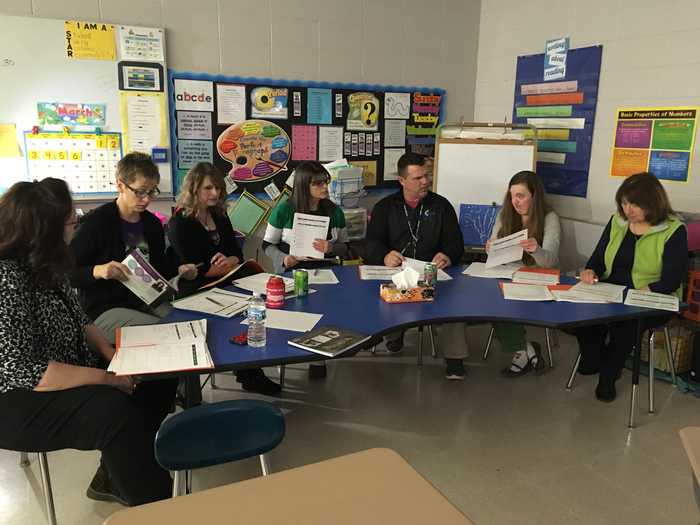 AES staff engaged in a self-directed reading professional development after school today. 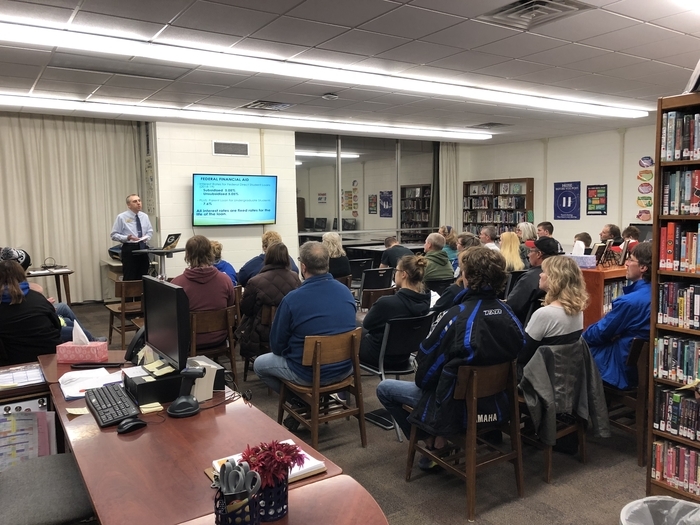 Junior Parent Night ~ Figuring out what to do after graduation can be scary. Junior parent night will look at the resources we have for college and career opportunities and how you access those resources. Join us on March 12th at 6:30 pm in the High School Gym to learn more. 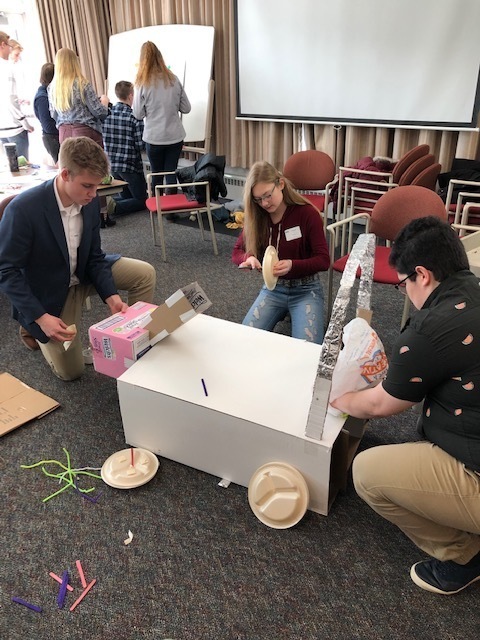 Athens High School Students took part at the Wisconsin Business World at UW-Stevens Point at Wausau last week. 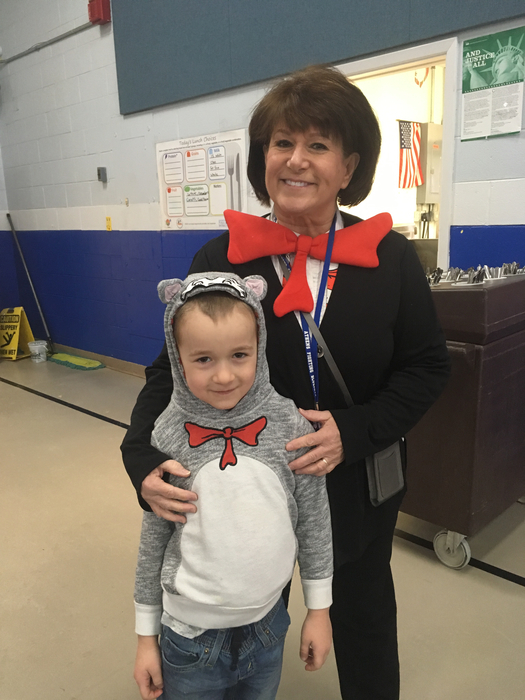 Kudos to AES and Mrs. Brewster for a great Read Across America Week! Athens Boys Basketball defeated Rib Lake tonight to win Regionals. 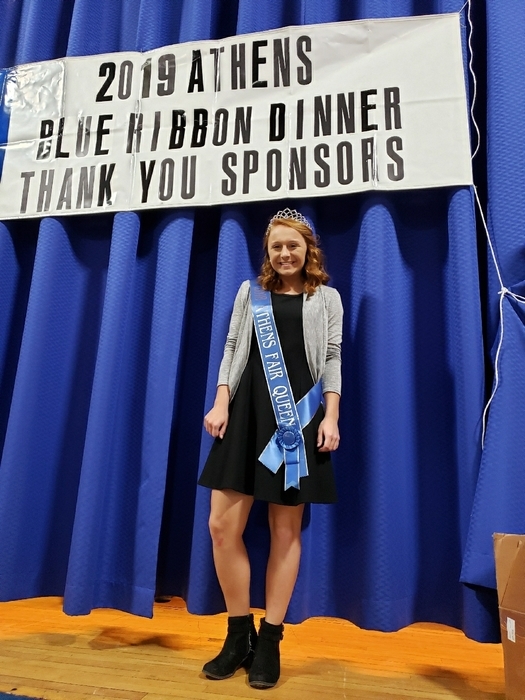 Athens Fair Queen and AHS Junior Abigail Olson at Blue Ribbon Dinner. Many thanks for great representation! Athens FFA and Athens Acres 4-H assist at Blue Ribbon Dinner. IF you cannot come visit us tonight, tonight's Boys Basketball @WIAA playoff game will be streamed on both our Facebook page (Stage View) and our YouTube Channel (Bleacher View). YouTube Link will come out closer to game time. Both streams are thanks to CESA 10. 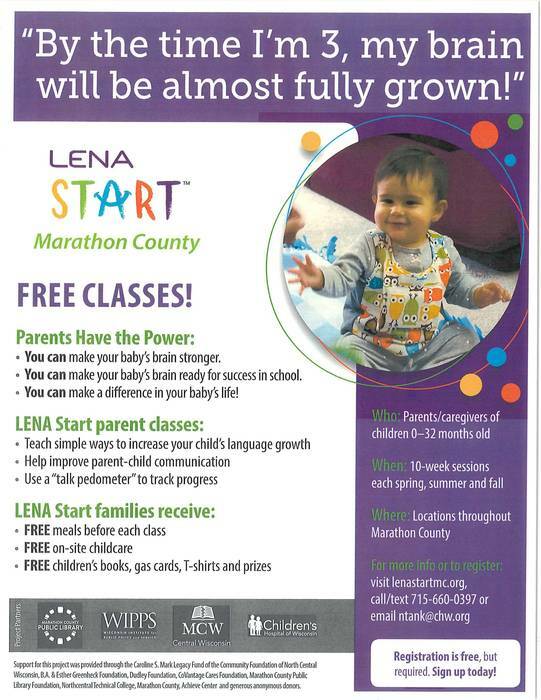 Parents and caregivers of children 0-32 months old - Please check out this free resource from Marathon County. 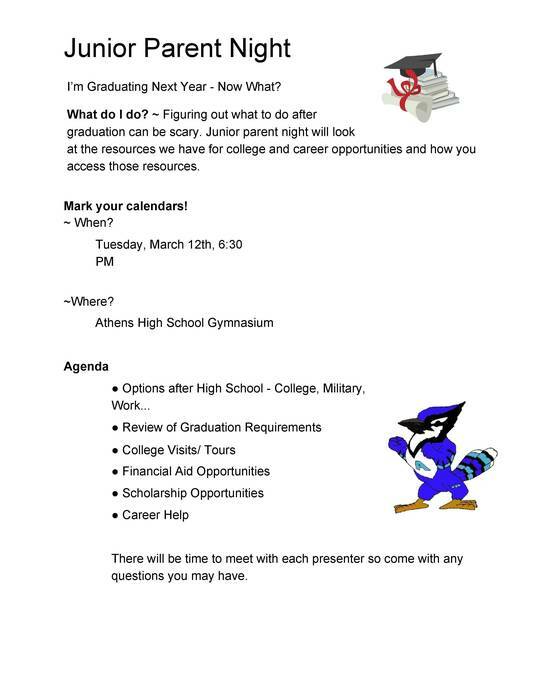 Parents of Juniors - join me for Junior Parent Night on Tuesday, March 12th at 6:30 pm in the gym. Reschedule Alert: FFA Donkey Basketball has been rescheduled for March 25th at 7pm. Presale tickets will be still available at $7 a piece. 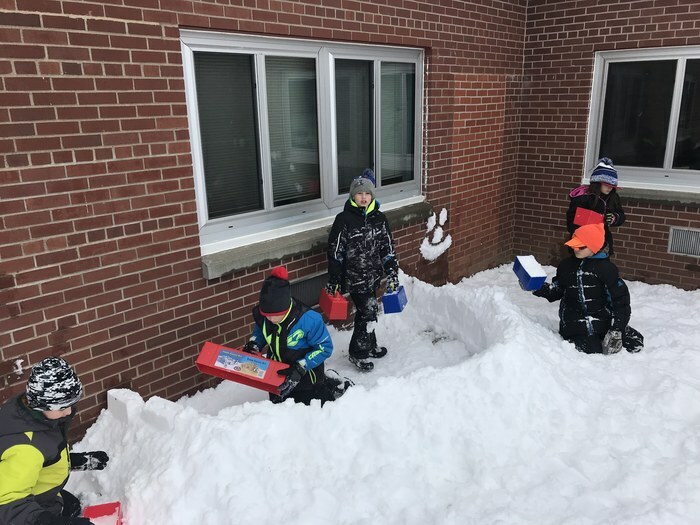 The YES Group donated 24 snow building blocks for the kids for winter recess. With the right tools and working together as a team, the 4th graders built an entire city. Reminder: FFA's Donkey Basketball game for tonight has been postponed for a later date. Tonight's Track Parent Meeting has been cancelled for tonight. We are looking to reschedule later this week. FFA's Donkey Basketball game for tomorrow night has been postponed for a later date. 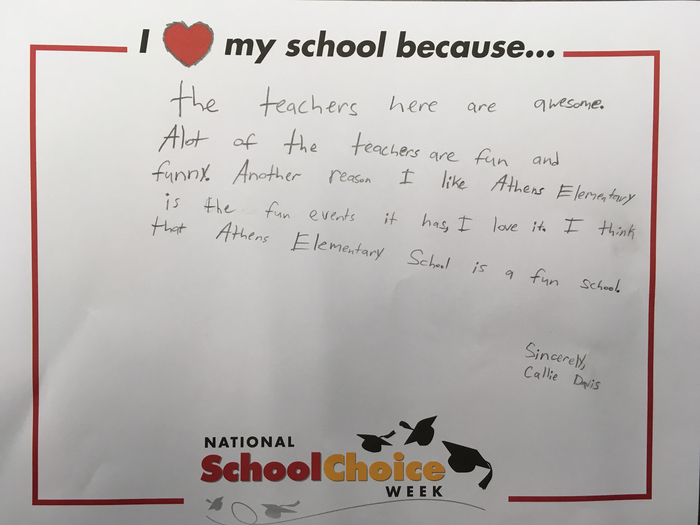 School District of Athens public and parochial schools. With the winter weather blizzard continuing through the night and a delay in county and township plowing, Athens public and parochial schools are closed tomorrow, Monday, February 25. 9th grade field trip to UWEC is cancelled for tomorrow due to the weather. Their will be a make up date for this trip that will come out later. Today, February 18, 2019, is the deadline for the NTC Foundation Scholarship. Go to https://www.ntc.edu/students/financial-aid/grants-scholarships/foundation-scholarships Click on Apply for A Scholarship, then sign in with your NTC ID and Password. Is it Harmless or Harmful? Parents - please check out the attached flyer about an opportunity taking place during parent/teacher conferences at the MS/HS next week. 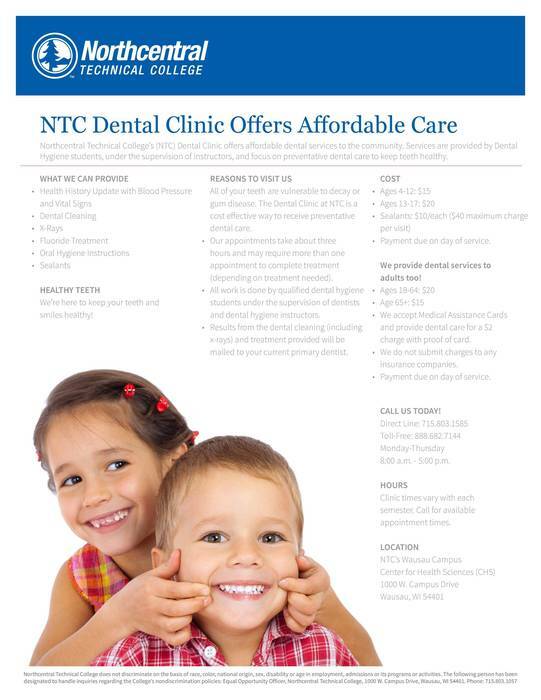 Athens Families - attached you’ll find a flyer noting services available to individuals and families through the NTC Dental Clinic. We wanted to share this with families in our district who may benefit from these services offered at a low cost. Thank you and have a great day! 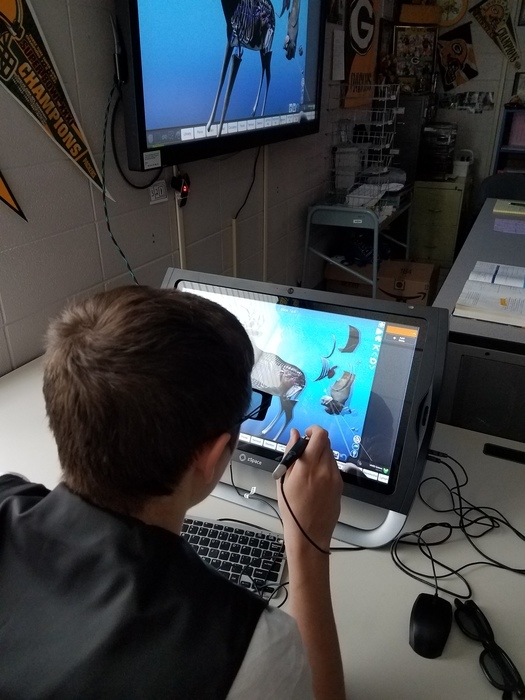 Today in our math classes, we are using a Z-Space computer to look at imaginary numbers and the 3rd Dimension in action! 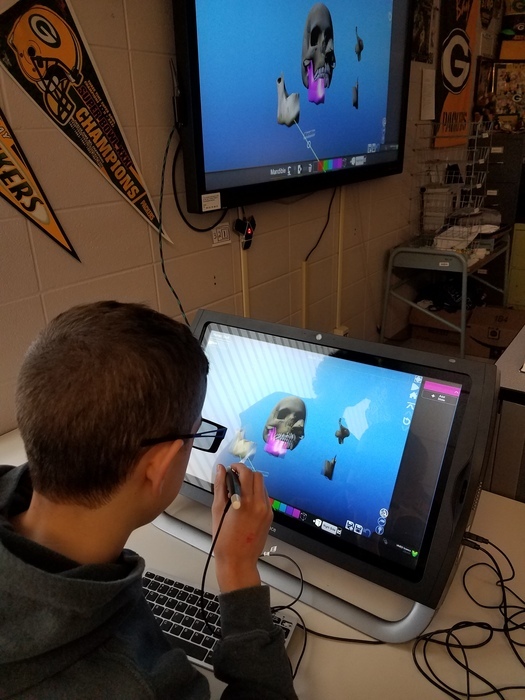 Students have 3D glasses and are able to dissect, animals, engines, mechanical items, anatomy, etc. in 3-Dimensional space. The students are amazed! High School Girls Basketball vs Rib Lake is rescheduled for Saturday, 2/16/19 at Athens High School. JV girls will play at 6:00 and Varsity girls will play at 7:30. Athens public and parochial schools are closed tomorrow, Tuesday, February 12. All afterschool and evening practices and events are cancelled Tuesday as well. Athens public and parochial schools are closed today, Thursday, February 7. All afterschool and evening practices and events are canceled. 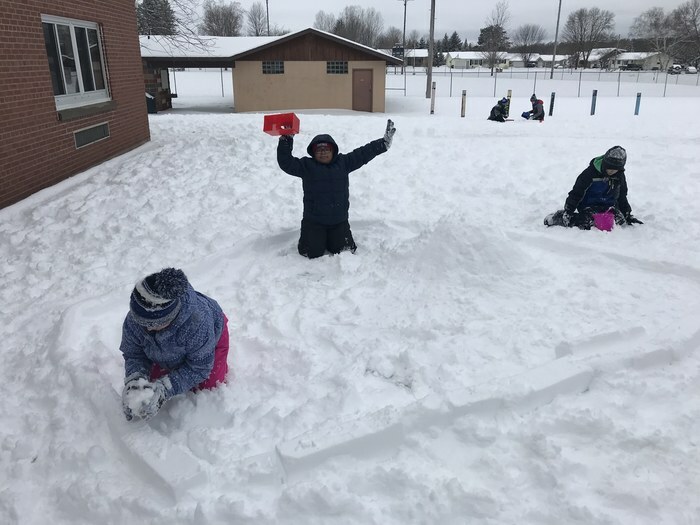 All after school games are canceled for today due to the weather. Practices will run til 5 PM. Tonight's High School Girls Basketball against Spencer has been cancelled. 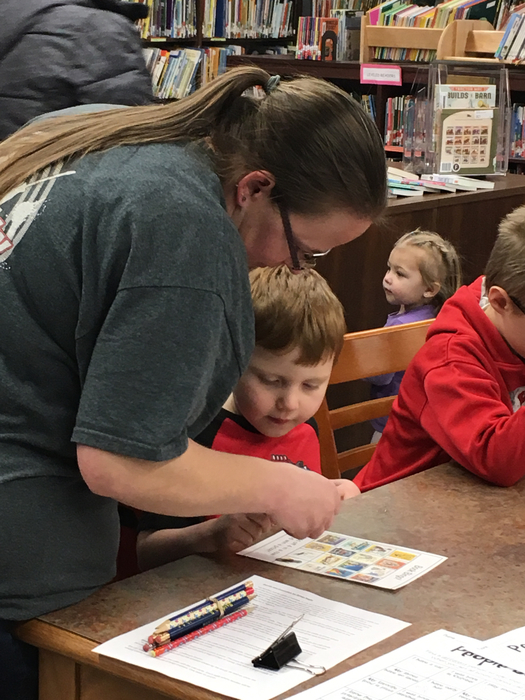 There is a special board meeting scheduled for Tuesday, February 5, 2019 beginning at 6:00 p.m. in the high school library. Staff, community members and those who were part of the focus group last week Thursday are all welcome to attend. Hope to see you there. Junior Parent Night will happen tonight starting at 5 pm. High School Girls Basketball Hosting Spencer will also happen begging at 5:45 pm. Middle School Girls Basketball against Stratford has been cancelled for today. Due to the weather, the schools of the School District of Athens are closed for Monday February 4th. 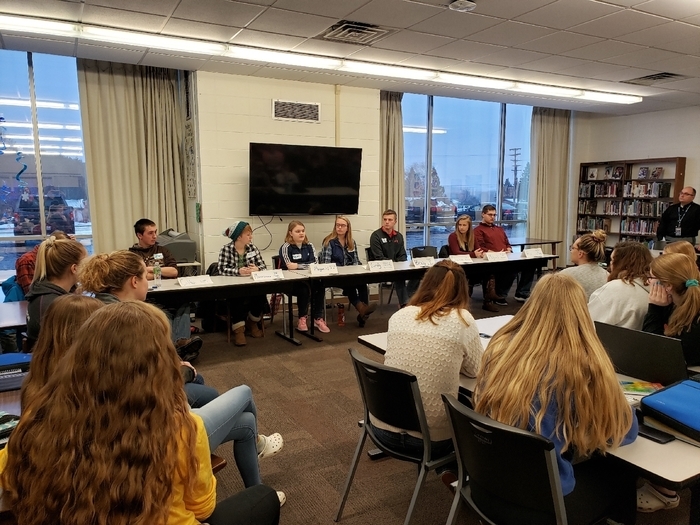 Superintendent Search If any community members are interested in being part of a group for the final interview of the three selected candidates, please come to the high school library on Thursday, January 31, 2019, beginning at 5:30 pm. The process will take approximately three hours. Thank you for your consideration. The schools of the School District of Athens will be close tomorrow January 30th and Thursday January 31st due to the weather. After school activities are canceled for the 30th. Varsity Practices will be allowed after 1 pm on the 31st. School will be released today at our regular time day. All after school activities are canceled with the exception to Varsity practices which will run to 4:30 pm. The buildings will be closed after 4:30 pm. All after school activities are canceled as well. The schools of the School District of Athens will be close tomorrow January 28th due to the weather. Download the School District of Athens App, bookmark athens1.org and follow us on Facebook and Twitter so you are up to date on the latest weather alerts. Middle School Girls Basketball at Abbotsford for tonight has been rescheduled for February 7 in Athens at 4:30. 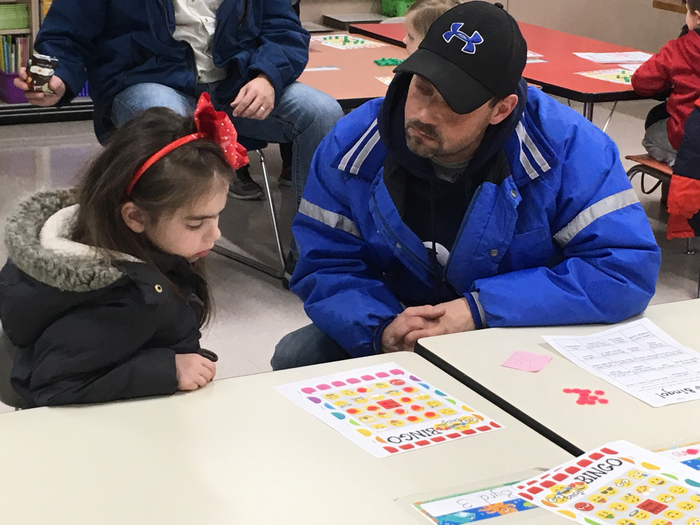 It’s BINGO night at AES! 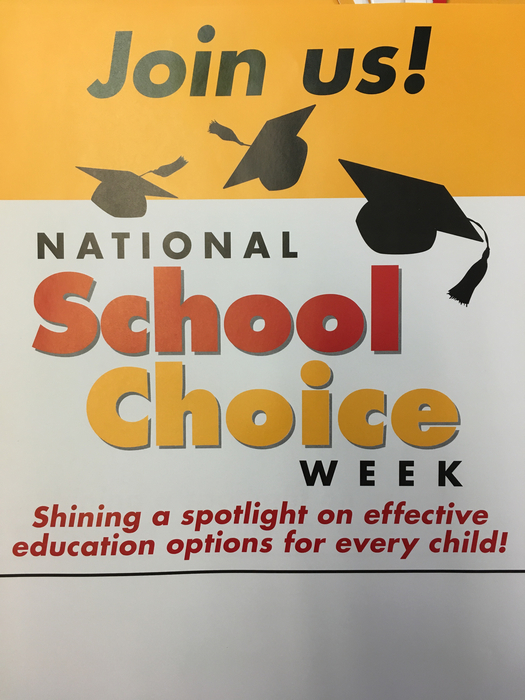 Celebrating School Choice Week at AES! 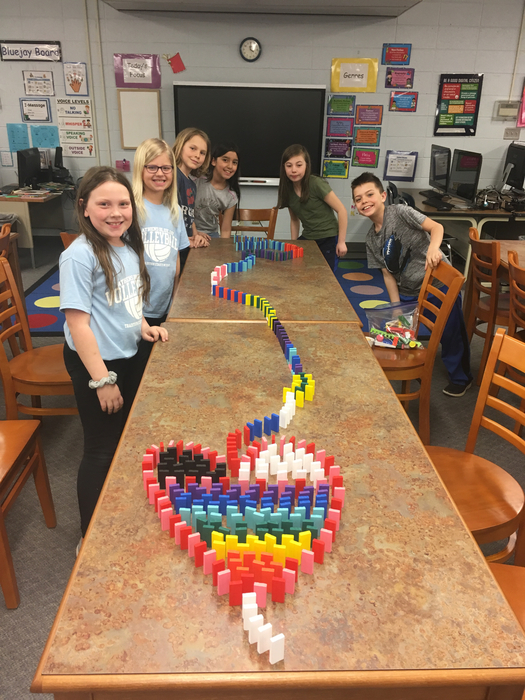 Check N' Connect Wednesday at AES! 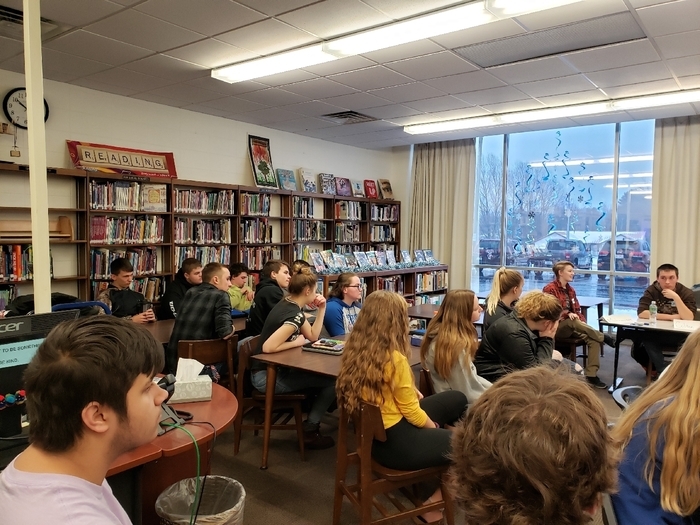 Students in Algebra 1 this week finished up their last day of the semester by giving Genius Hour presentations. 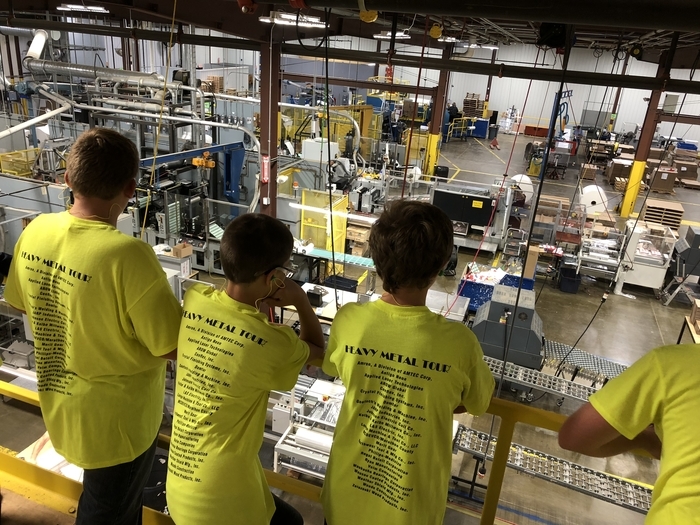 We learned about an array of topics from machining, welding, vexilar, animals, chemical reactions, painting, sports, etc. It was a great way to end semester 1! 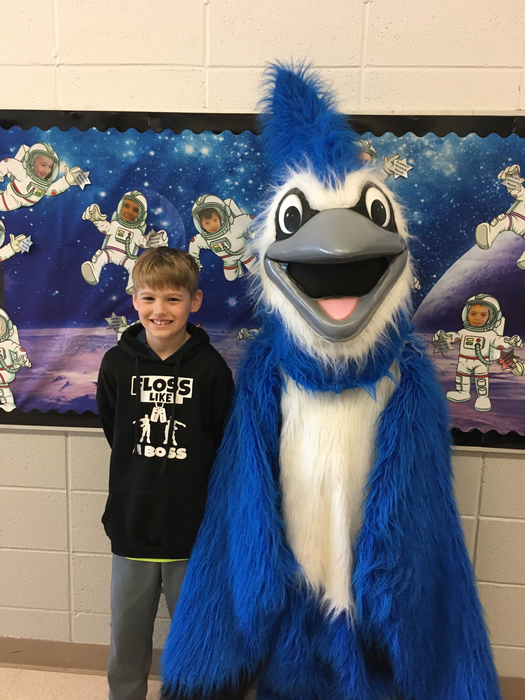 Congratulations to our ELL Blue Jays who completed the annual test for English proficiency this week! Score results will come back in April. Child Development Day will be on Thursday, February 7th at Athens Elementary. 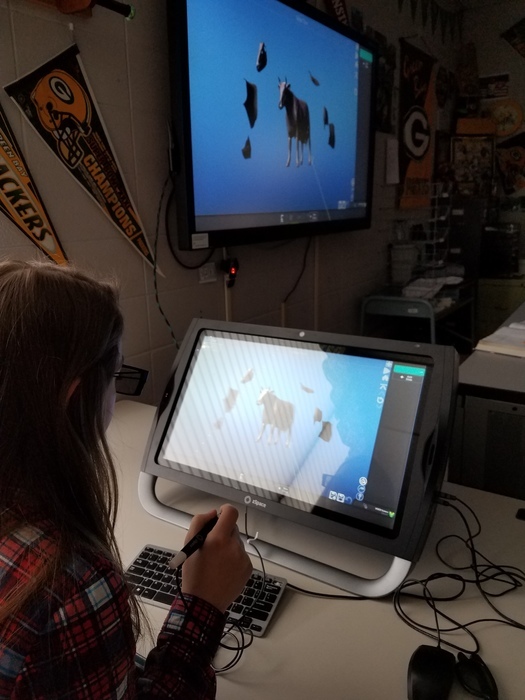 Looking forward to beginning the second semester classes at the high school. 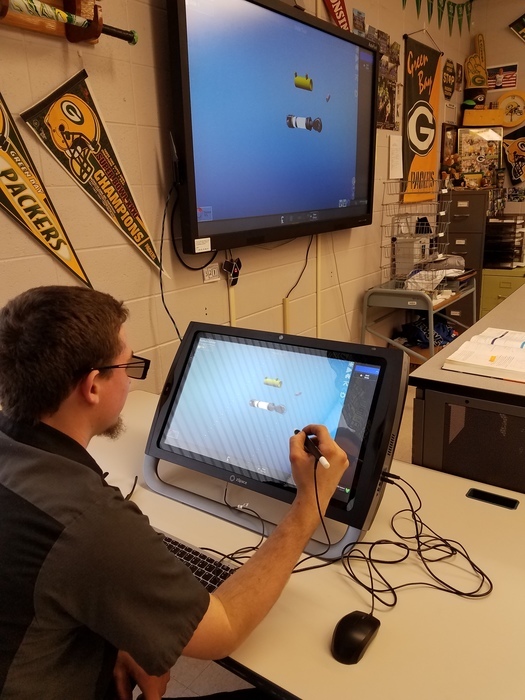 MAP testing begins next week. Good luck testers! Life is good at Athens High School. There will not be any classes for the kindergarten and Pre-K classes on Feb. 7 & 8 due to Child Development Days. Athens Elementary School can look forward to Valentine's Day-FCCLA will be back with a sweet treat! 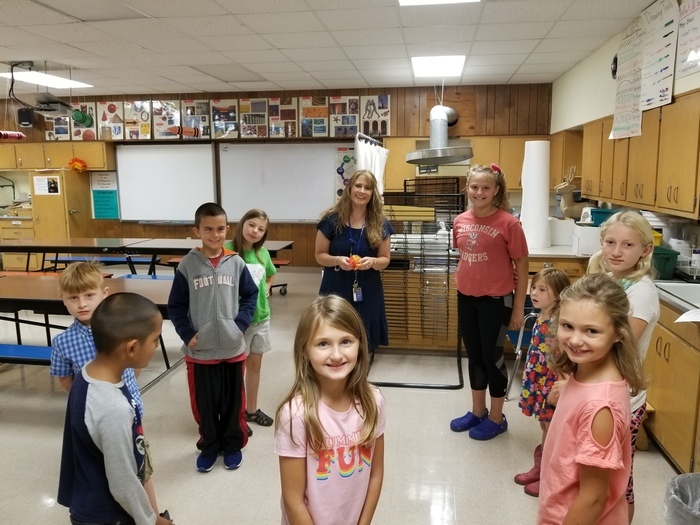 3 months ago, Mrs. N.
The kindergartners searched through the school to find their missing gingerbread man! 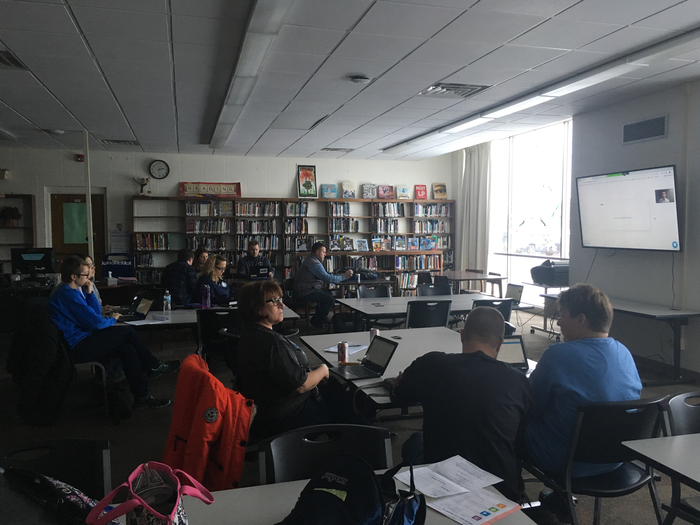 Exciting changes for all district staff to learn how to use social media to show you our cool curriculum items. 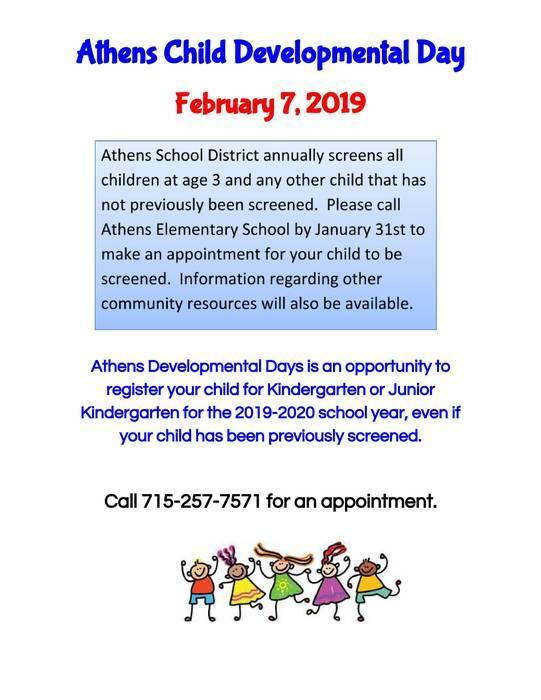 Please call Athens Elementary School at 715-257-7571 to make an appointment for your child to be screened. Tonight's Wrestling Match Vs Phillips has been cancelled. Tonight's Boys Basketball Game at Prentice has been cancelled. Girls Middle School Basketball at Abbotsford has been cancelled for tonight. Girls High School Basketball at Spencer has been cancelled for tonight. 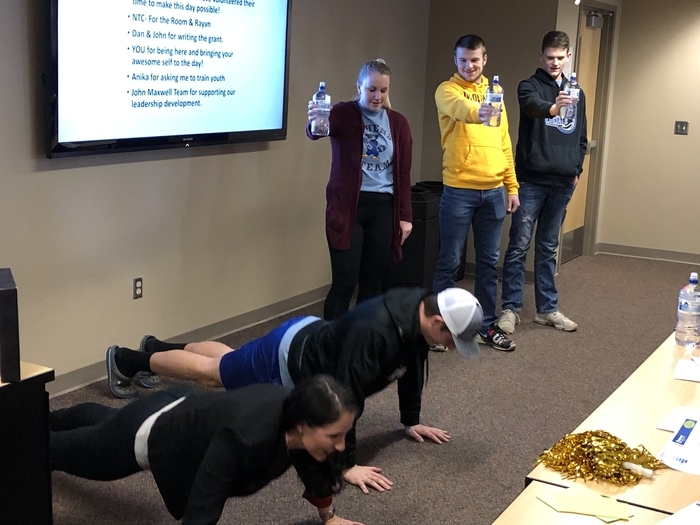 Sam Cotter -UWSP Wausau leads Juniors in an ACT prep session during ACP today. 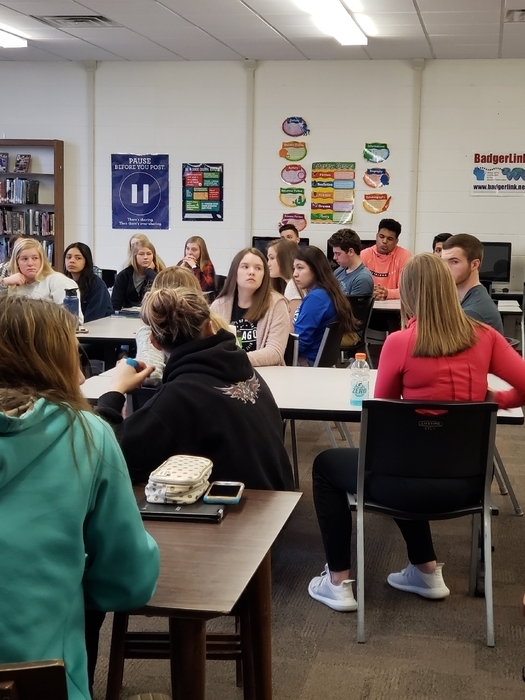 Thank you former AHS students for returning to speak to our current seniors! 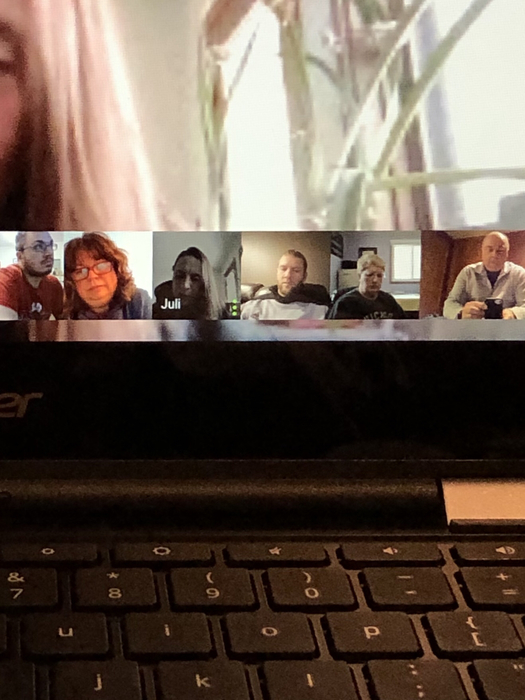 It was a great conversation. Nominations for the Athens Distinguished Alumni Award will be accepted until January 31, 2019. 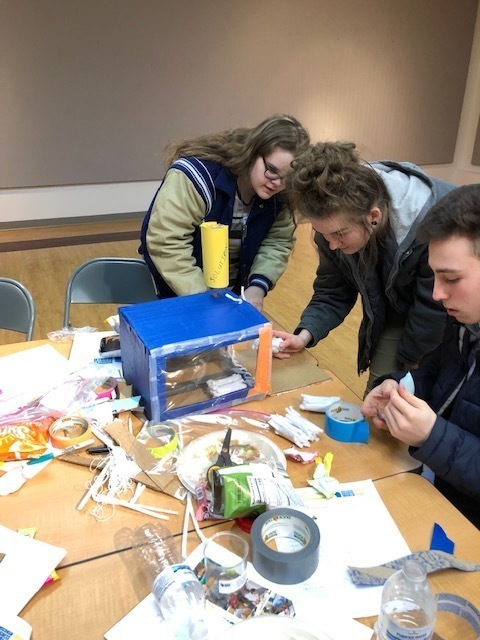 Applications are available in the Athens HS office or by emailing priske@athens1.org. We are seeking nominations from a variety of age groups, careers, volunteerism, and any other contributions made. Thanks for making a nomination! 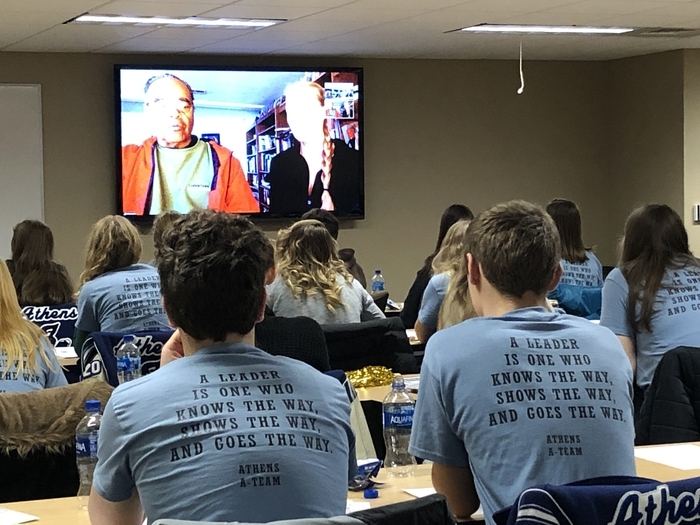 The Athens A-Team participating in IMPACT Leadership training. 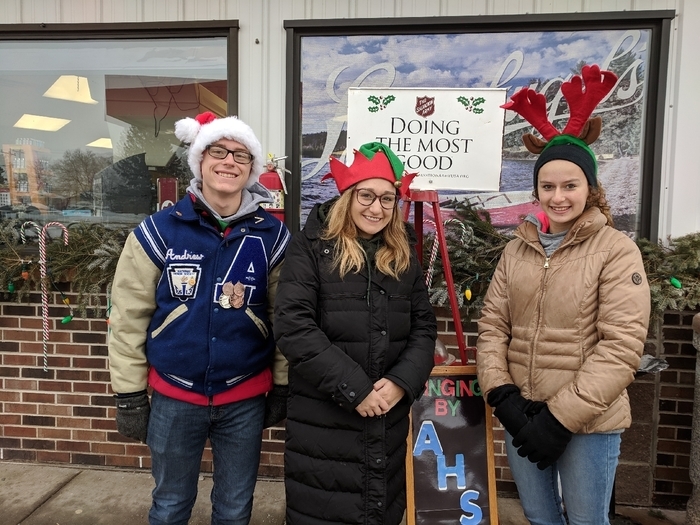 Attention all High School student drivers- please park near the staff side or in the back parking lot tomorrow, Friday, December 14th to allow for parking during our Elementary Christmas Concert. Thank you. Edgar MS and Athens MS are canceling the middle school boys basketball games for today, 12/11/18. The MSBBB teams will practice as usual from 3:30-5:30. 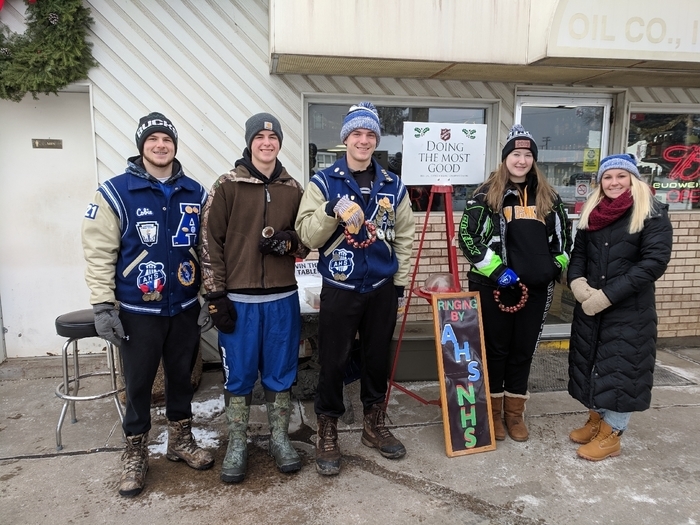 NHS rings the bell for Salvation Army of Marathon County. Fiesta Ole at Athens Cafe! Spanish I and Spanish II students were treated to a Mexican meal at the Athens Country Cafe. Maestro Danielson, Athens Spanish Teacher, came from Gilman to join us. Enchiladas, horchata, and quesadillas were authentic and delicious! Click on the folllowing link for a helpful resource regarding tomorrow's drill. http://redtri.com/5-tips-for-talking-to-your-child-about-lockdown-drills/. 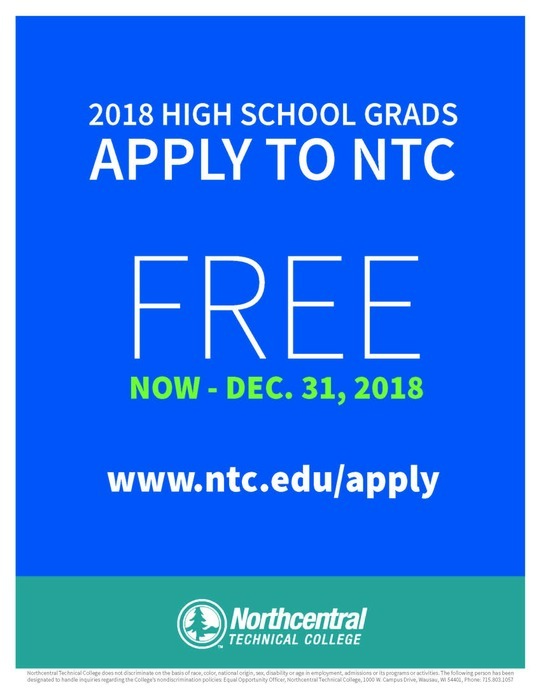 2018 Athens Graduates - NTC is offering a free application period for 2018 grads. Check out the attached flier. 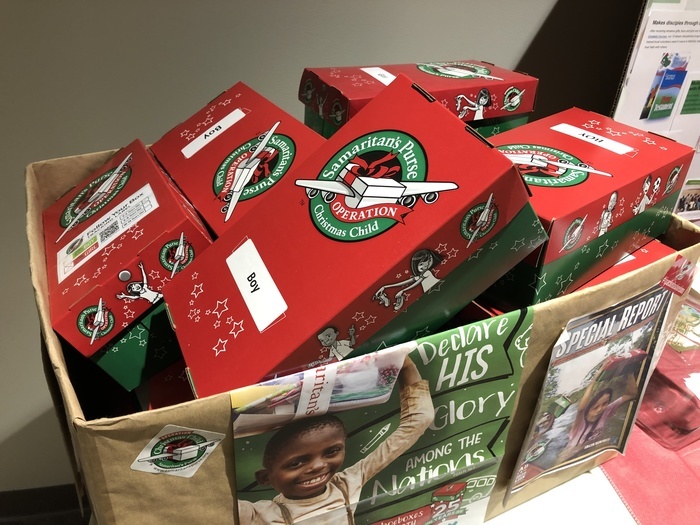 Athens FCA students donated 13 boxes to Operation Christmas Child. These boxes of toys and supplies will be sent to children all over the world. Thanks Athens FCA! 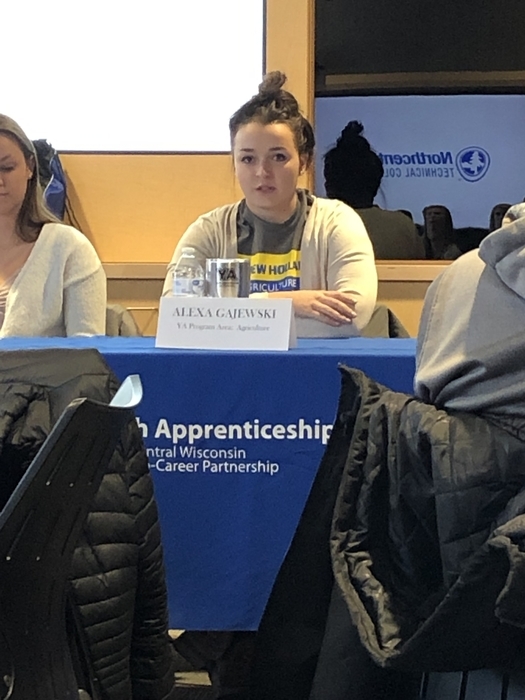 Athens Alumni Alexa Gajewski speaking at NTC YA Day! 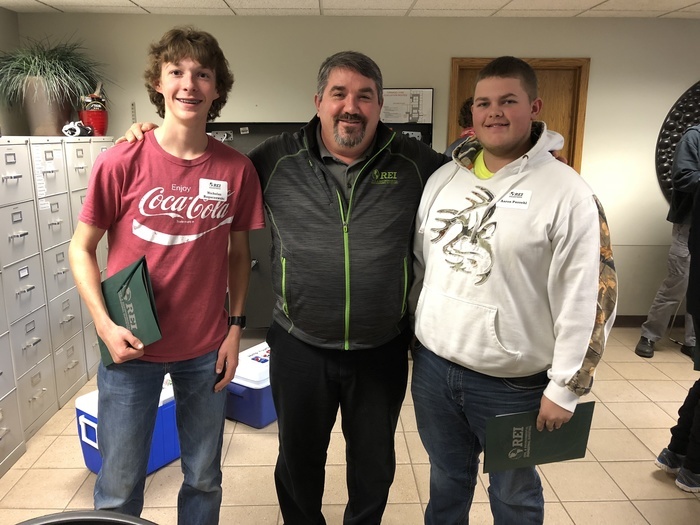 Nick and Aaron participated in a lunch and learn at REI Engineering Inc. on November 1 to learn more about careers in engineering. 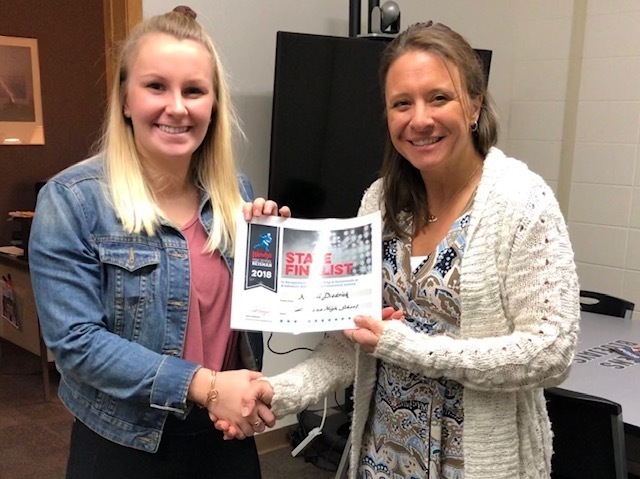 Kenadi Diedrich has been chosen as a state finalist for the Wendy's Heisman Award. 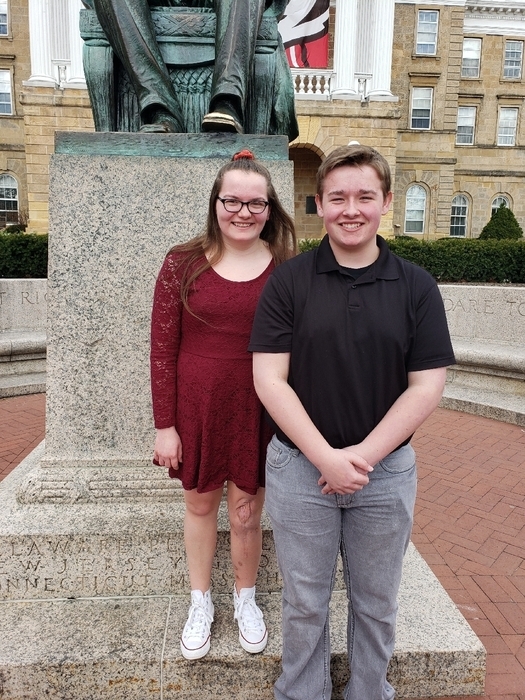 State Winners will be announced on November 7. Good Luck Kenadi! Paper copies of the survey are also available at the district office located at 601 West Limits Road. 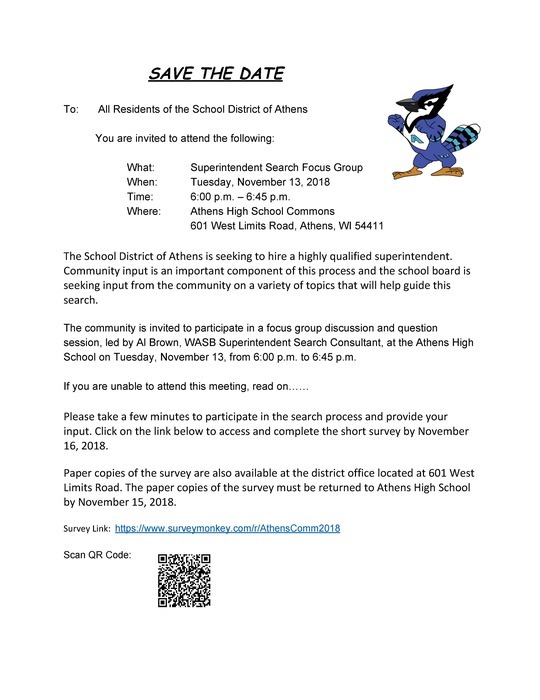 The paper copies of the survey must be returned to Athens High School by November 15, 2018. 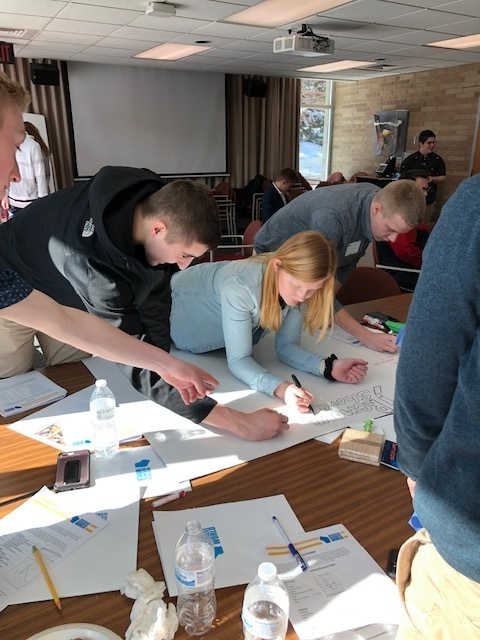 You are invited to attend the Superintendent Search Focus Group Tuesday, November 13, 2018 from 6:00 p.m. – 6:45 p.m at the Athens High School Commons 601 West Limits Road, Athens, WI 54411. Please see image attached for details. 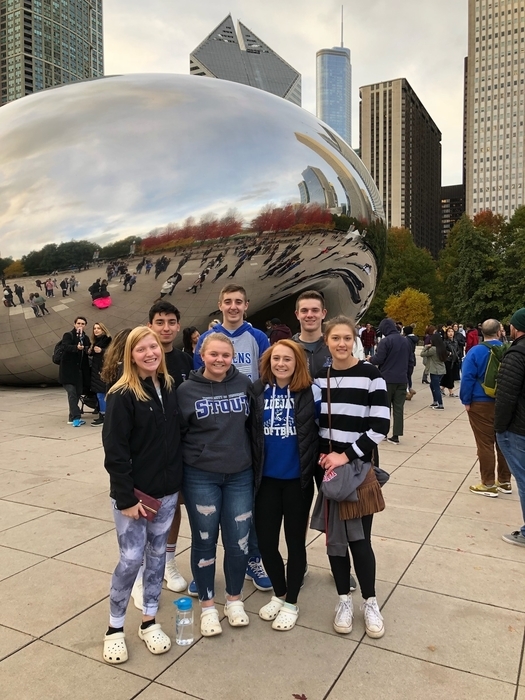 Athens FBLA members went to Chicago for the FBLA National Fall Leadershop Conference. 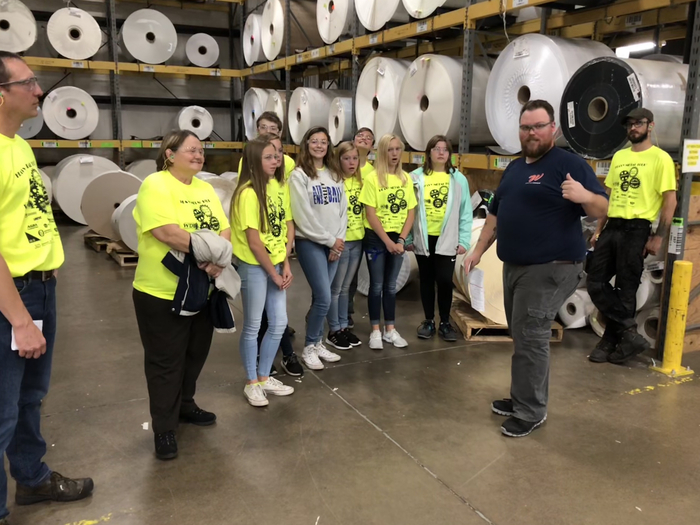 Along with attending leadership workshops and business seminars, students got to tour the city. 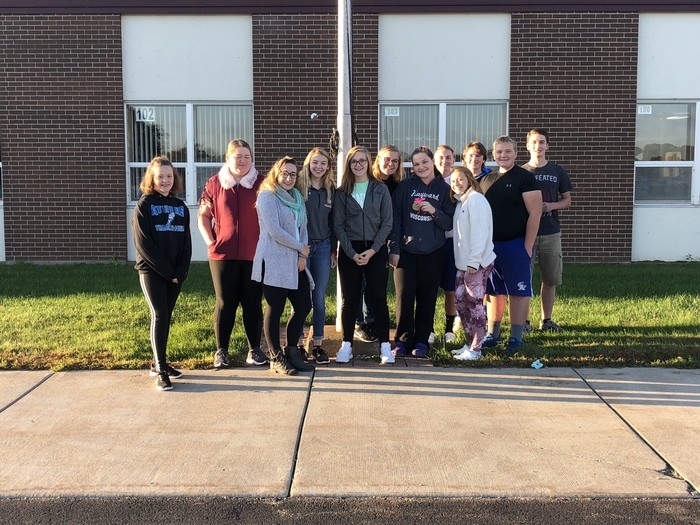 5th grade used red Solo cups to spell Drug Free Journey on the school fence during Red Ribbon Week at AES! 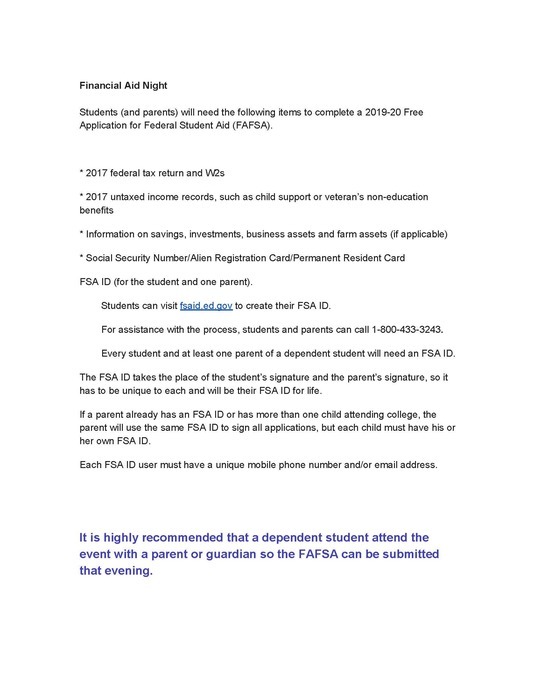 College Bound Students and Parents - Join us tonight for our Financial Aid workshop. Families will be able to complete their FAFSA on site. Scholarship information will also be shared. 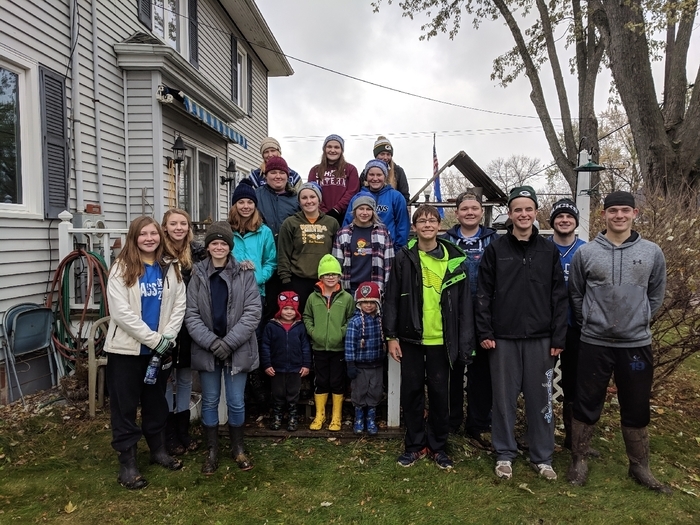 Make a Difference Day. 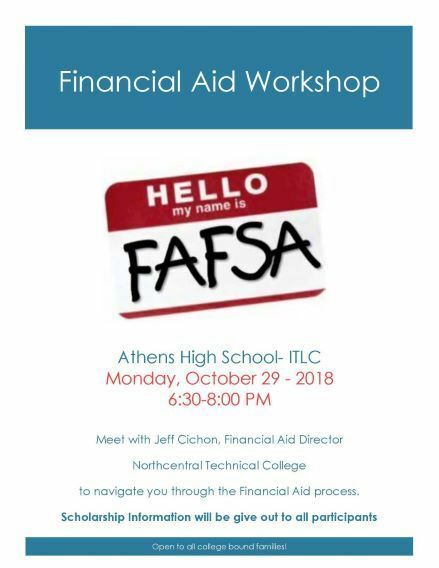 NHS, BlueCrew and Athens Acres 4-H.
Just a reminder about our Financial Aid night on Monday, October 29th. We will begin at 6:30 pm in the ITLC. Attached are some reminders from our presenter. Due to a scheduled upgrade, Infinite Campus for Athens will be unavailable this Friday, October 26, 2018. If you are attending parent teacher conferences on October 18th, come and hear about our new Mental Health Counseling services from the Center for Human Development A short parent presentation will take place at 5:30 pm and 6:30 pm. in room 123. Based on the rain that we have received, the rain currently coming down and the forecast of rain on the way; Athens and Phillips are canceling today's Middle School Football game. 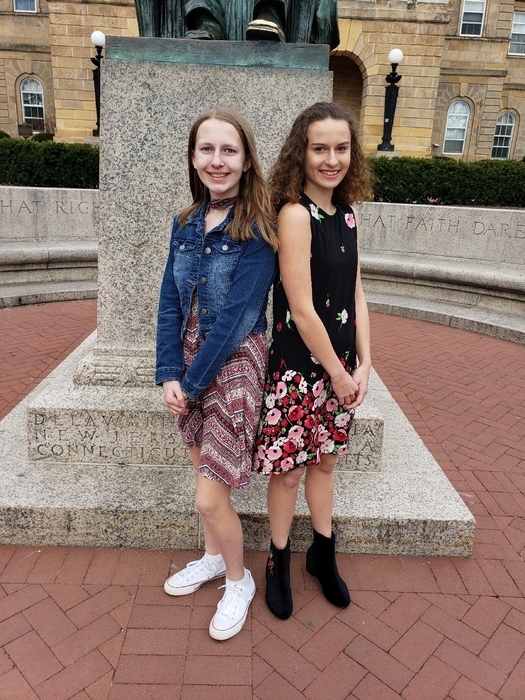 The School District of Athens students benefit from the leadership and vision of our school board. 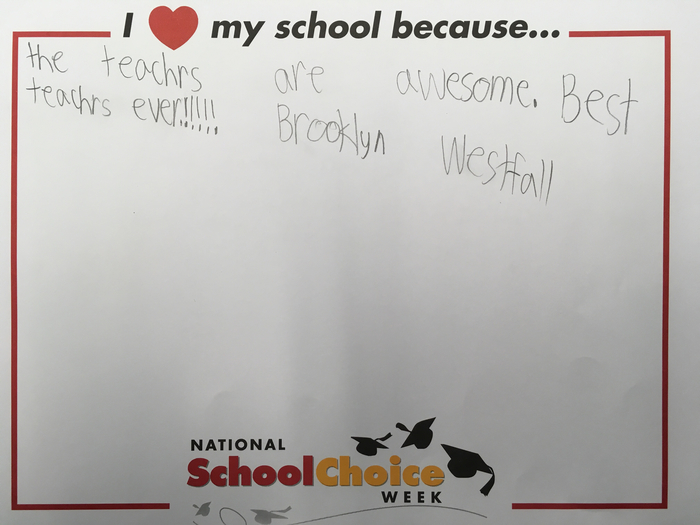 Oct. 7-13 is Wisconsin School Board Week so take time to thank these school leaders. 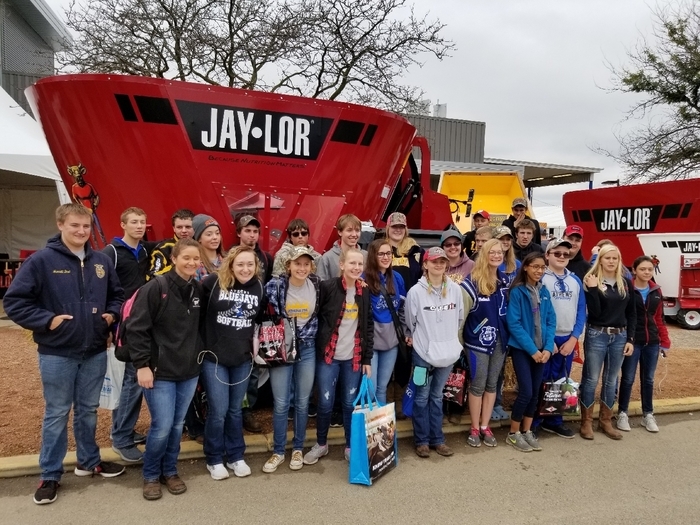 Athens FFA Students participated at the World Dairy Expo in Madison. Some students took part in judging and showing events. 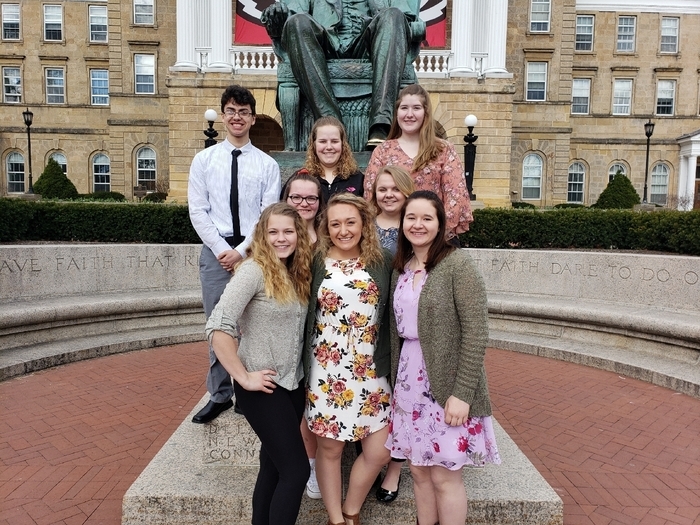 The 2019 Elks National Foundation Most Valuable Student scholarship contest is open to any high school senior who is a US Citizen. 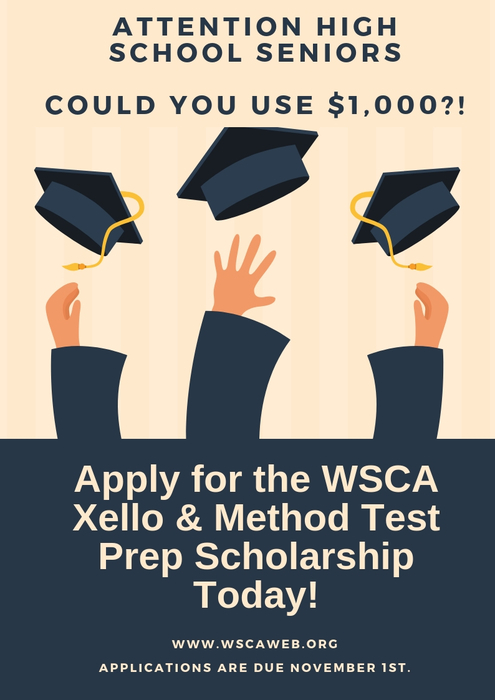 Applicants will be judged on scholarship, leadership, and financial need. Go to https://www.elks.org/scholars/scholarships/mvs.cfm to apply. 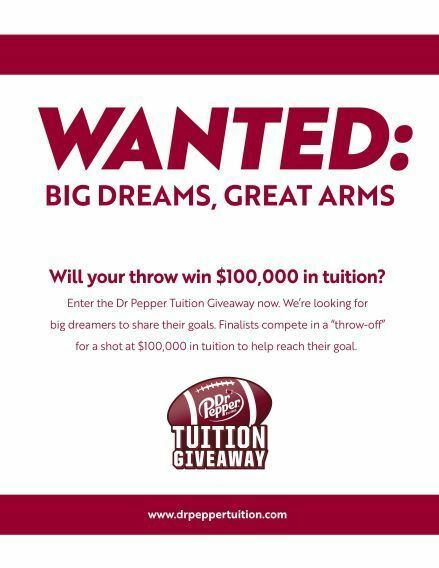 Dr. Pepper tuition give away.... Seniors, check out this opportunity from Dr. Pepper. 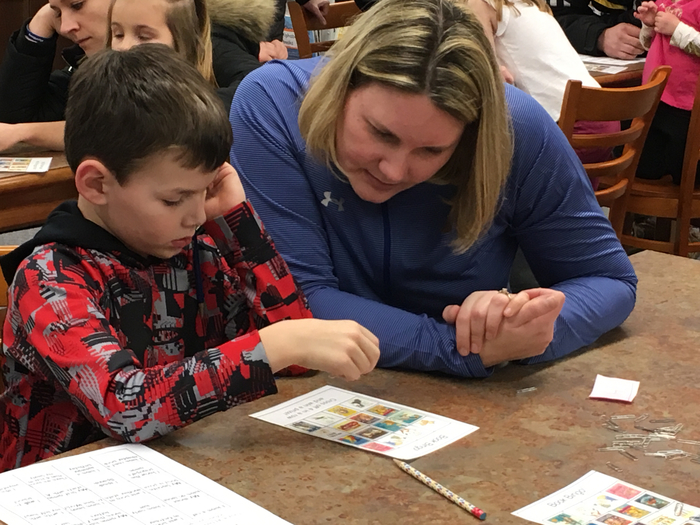 Students were eager to build new connections with fellow students and staff members at Athens Elementary during their first weekly Check N' Connect group. College Bound Students and Parents - Plan to attend the annual Financial Aid workshop on October 29, 2018. Families will be able to complete their FAFSA on site. Scholarship information will also be shared. The Athens at Colby MS Football game scheduled for today has been canceled. Today's Cross Country Meet has been cancelled due to weather. Due to weather concerns we are moving tomorrow’s football game up two hours. Kickoff ar 5:00. 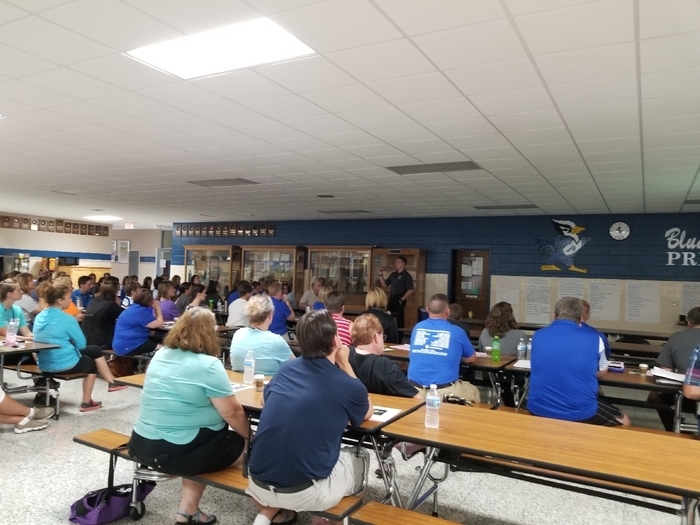 School District of Athens staff are spending the afternoon refreshing on active threat training with Peaceful Warrior Group. Visit www.fancloth.com/54411/405413 to order Bluejay apparel and support the cross country team. Orders can be made online, at the high school office or by contacting a member of the cross country team. Orders are due by Friday, September 7. Don't forget that the 6th Grade Parent Meeting is tomorrow, Tuesday August 21st at 6 pm at the Athens Middle/High School. The post cards that you may have received has the wrong date. 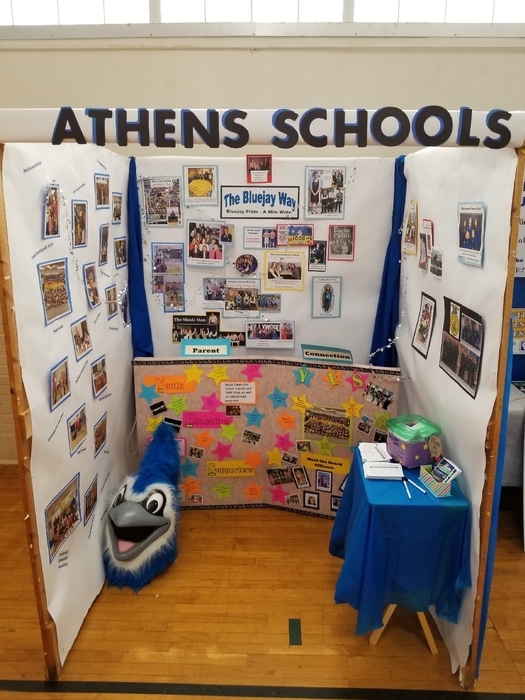 Check out our great school booth done at the Athens Fair. 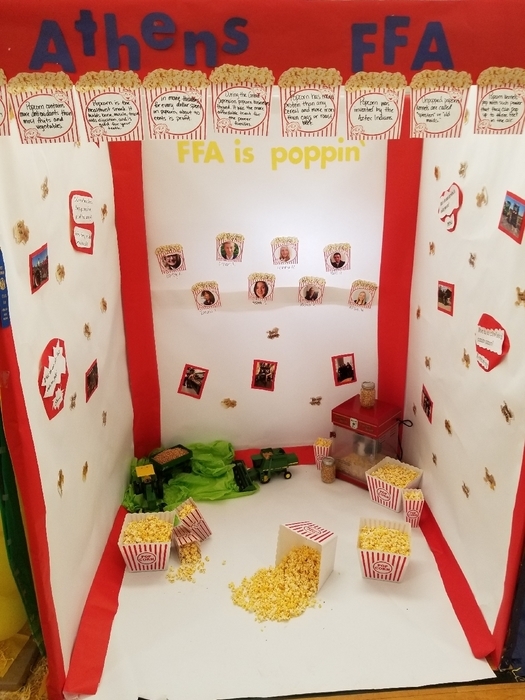 Congratulations to the Athens FFA on their blue ribbon fair booth. Check it out at the Athens fair in the Community hall. The new sports season is beginning. To see who we are facing and where, check out the Athletics Section on our new website http://www.athens1.org/o/athens/athletics or on the new School District of Athens App under the Athletics Tab. Don't forget Middle and High School Registration and 6-11 students pictures is Thursday August 30th from 11 am to 7 pm. Marching band starts Monday, August 6 at 7:00 pm in the High School music room. We would enjoy seeing all band members join us that evening. Parents, 6th Graders, and 9th Graders Please take some time to read over the Athens Co-Curricular Code. Check your email for more details. 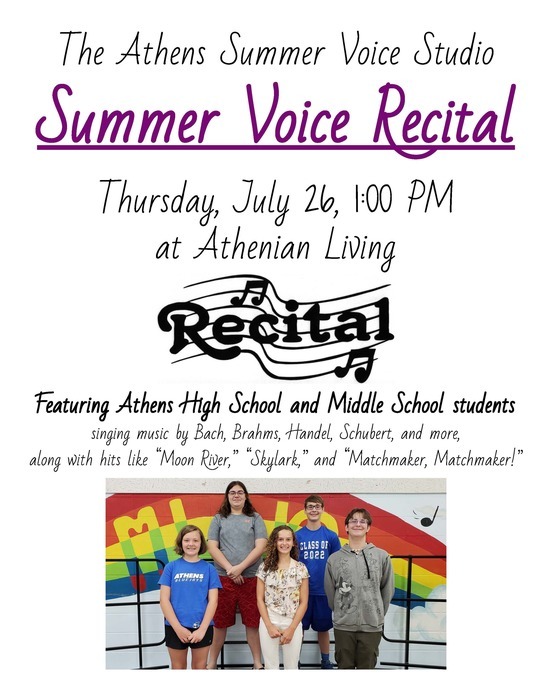 The Summer Voice Studio class is holding their voice recital this Thurs July 26 at 1:00 at Athenian Living. All are welcome to attend. 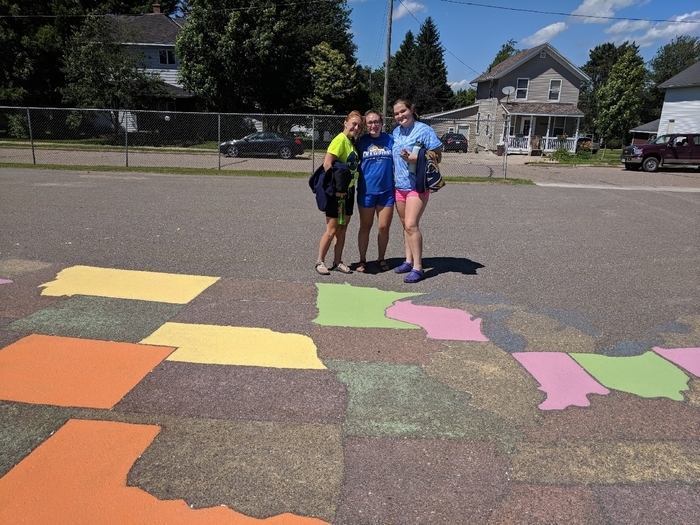 National Honor Society paints USA map at AES. 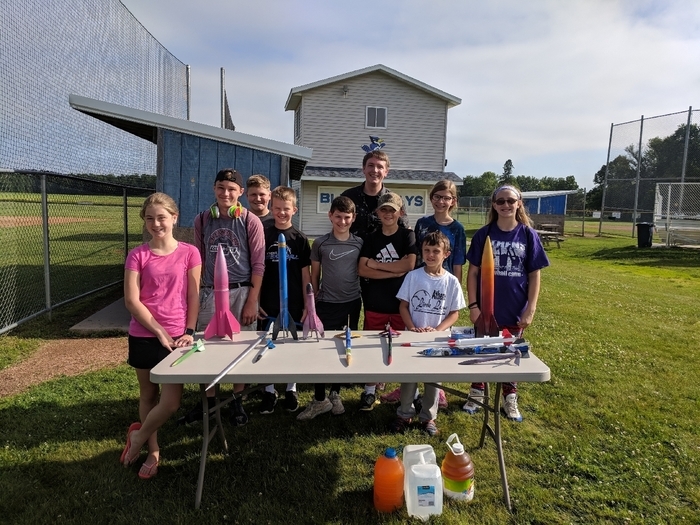 Summer school Rocket Building class with Mr Triebold. There will be a special presentation from Rep. Edming and Sen. Petrowski. The 2018 State Champion Baseball Team and Coaches, will be recognized on Wednesday, June 27 at 5:30 in the AHS Library. The Boys Baseball team will be playing against Thorp tommorow at 9 am at Fox Cities Stadium. Let's go Jays! Seniors are graduating tomorrow! 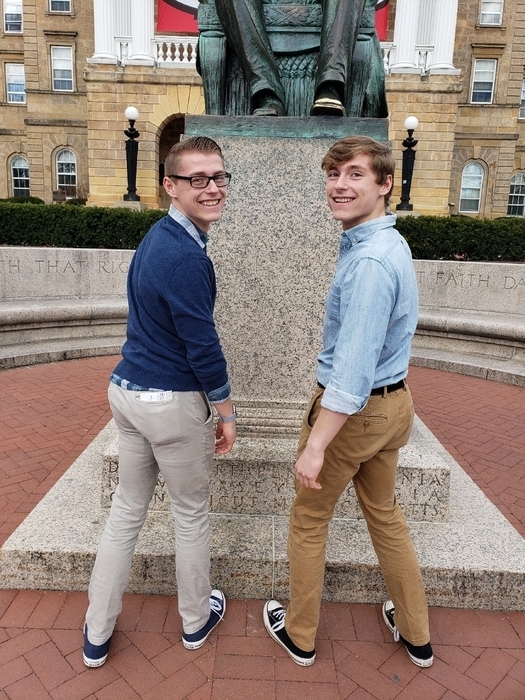 Come join us for their celebration! 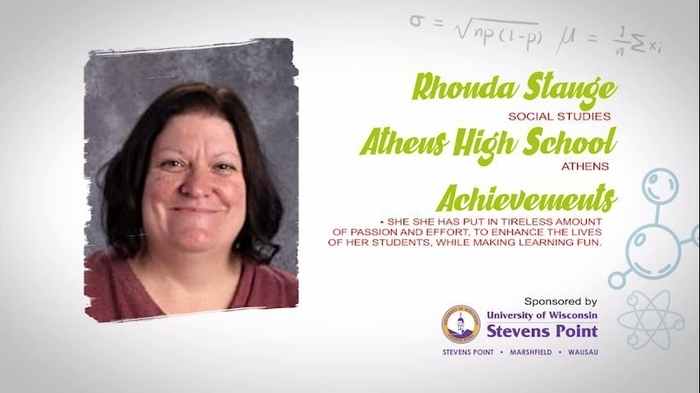 It's another great day at the School District of Athens!